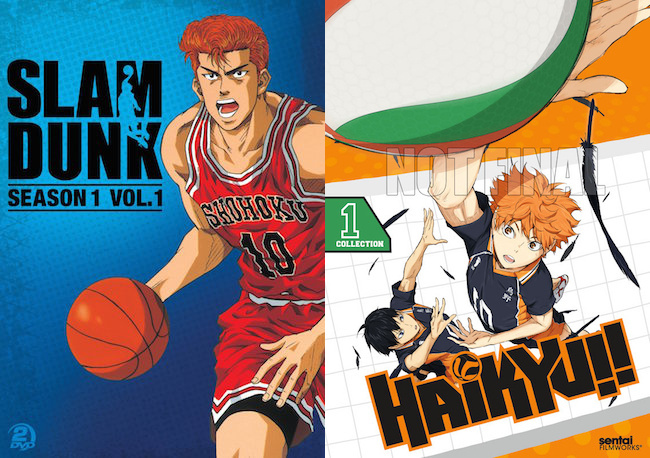 There are a couple of sports anime series that have North American disc releases scheduled in coming months: Slam Dunk on May 12th and Haikyu!! on June 2nd. Cinedigm’s first Slam Dunk DVD set was originally scheduled to come out last December but that month passed with no updates about a revised date until recently when the current May date appeared on Rightstuf and other retail sites. The set is listed with 14 episodes and English & Japanese language tracks; the English dub to be included is suspected to be the same as what was previously released in the mid-2000’s by Toei. The first subtitled-only DVD and Blu-ray collections for Haikyu!! were included in Sentai Filmworks’ June 2015 releases announcement in late Februrary and will have the first 13 episodes of season 1. The other season 1 set would presumably have the remaining 12 episodes (14 through 25). A second season of the high school volleyball series has been green-lit.